First, you must download and install GenoPro. After installing GenoPro, you will see a registration dialog for you to optionally request a free evaluation key. You can use GenoPro without registering, however you will be limited to only 25 individuals when saving the document. 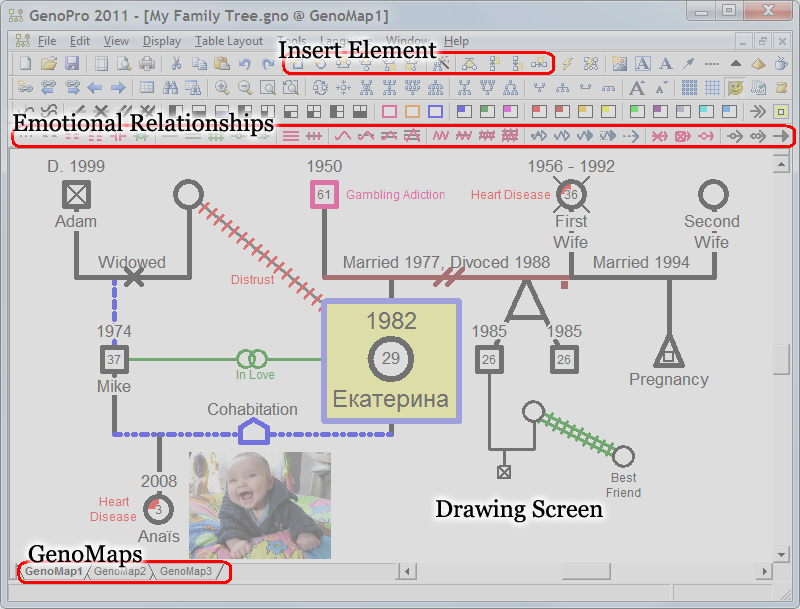 GenoPro is a software program specialized to draw family trees and genograms. To see a sample genogram, click on the Help menu and select the menuitem Sample Files and open the document HarryPotter.gno. The middle is the drawing screen, that is where all the visual aspects will be displayed. You can quickly zoom in and out with the mouse wheel (+ and - key if you don't have a mouse wheel). Learn more about GenoPro zoom. The lower left section contains tabs to switch between GenoMaps, those are sub genograms inside the same document, they are very useful if you have many individuals. Learn more about GenoMaps. The lower toolbar contains emotional relationships between individuals. Learn more about emotional relationships. The right-hand toolbar is for bookmarks, for quickly returning to a saved specific location. Learn more about bookmarks. If you are starting from a blank new document, we recommend to start with the family wizard. Click on F to start entering information with the help of the Family wizard. Enter as much information as you know about your family and watch the tree take shape before your eyes! Use GenoPro to store pictures and data, including contact information, education, occupation, important life events, medical pedigrees, and so much more. Family trees are as old as mankind. They can be found in old family Bibles, Torahs or scrolls. They can be drawn by school children or experienced genealogists. And now they reach their conclusion with the genogram: the rough sketch becoming a work of art with GenoPro. At GenoPro, we understand that family relationships go beyond generic parent and child relationships. There are complex interplays within a family unit which can only be understood through the use of a genogram. A genogram will not only show you the names of people who belong to your family lineage, but how these relatives relate to each other. For example, a genogram will not only tell you that your uncle George and his wife Anita have two children, but that their youngest child was sent to boarding school, that Uncle George suffered from depression, was an alcoholic, and a philosopher, while Aunt Anita has not spoken to her brother for years, has breast cancer and has a history of being unfaithful. Family history has never been so interesting! To get started, let's introduce the most common toolbar buttons to build your family tree. Adding an individual or a new family is as simple as a mouse click or pressing a key on the keyboard. For instance, you can press the keyboard key F to invoke the Family Wizard and a create a new family. New Male (W). A male is represented by a square and can be inserted by pressing the keyboard key W. Use the mouse to position the individual (male) where you want him to be displayed in your family tree. New Mate (M). Creates a mate (husband or wife) for the selected male or female. This button is very handy to create a second union for an individual. New Parents (P). Creates parents to the selected individual. If parents already exists, GenoPro will prompt to create adoptive parents instead. New Son (S). Adds a son to the selected union. New Daughter (D). Adds a daughter to the selected union. Family Wizard (F). 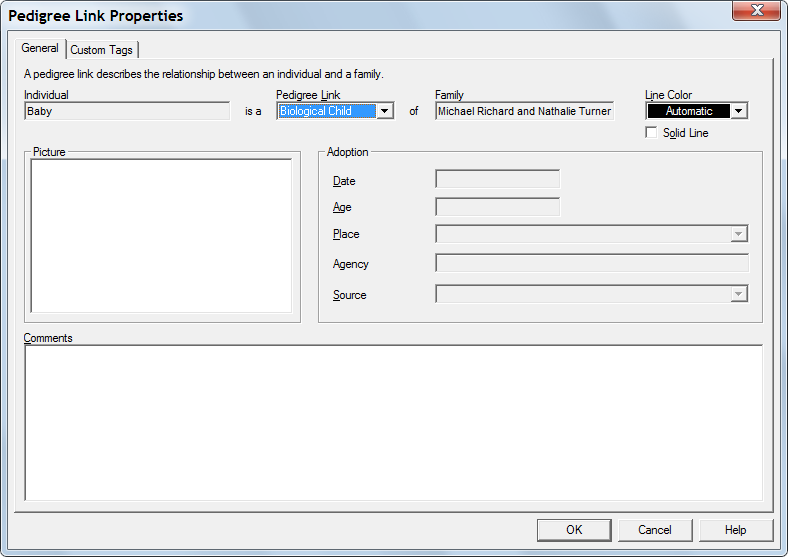 Displays a dialog to create a new family and/or add children to an existing family. Here is a sample of a family of three children. GenoPro uses the paradigm of "links" to determine the role of each individual in a family. There are two fundamental type of links: parent link and child link. The idea is similar to the following statement: A is the parent of B, C is the child of D, and so on. When you build your family tree, you add individuals (males and females) and link them together as parent and child. Links are very powerful to outline the pedigree, and one individual may have more than one link. Typically an individual has one child link and one parent link, but it can have more child link if adopted or more parent link if married more than once. To create a link, you select the individual you want to bind to the family tree, right-click with the mouse and select "Link as Parent" if the individual is a parent, or select "Link as Child" if the individual is a child. The mouse cursor will change to so you point-and-click to the family (union object) where the individual is the parent or the child. All links originate from an individual and end at a union object (family). Many users often ask: How do I link a child to his parent? The answer is simple: you create a union object, link the parent to the union object and link the child to the same union object. All children linked to the same union object are siblings. Please take a look at the figures Child Link, Parent Link and Union Object to see where such links appear in a genogram. It is very important to grasp this model, otherwise it will be confusing when an individual has been married many times, or when a child has been adopted by foster parents. If you select the wrong link, you can delete it, create a new one or simply change it. To change a link, double-click on it to bring this dialog. Parent. The member is a parent (or a potential future parent). Child. Biological child of a natural father and mother. Adopted Child. This is the case of a child legally adopted by a family. Adopted children are displayed by a blue line. Foster Child. A child being placed in a family or a boarding home who is being reared by someone other than his natural father or mother.